Manali and Shimla shivered at minimum temperatures at minus 2.0 degree and minus 0.8 degrees Celsius respectively. 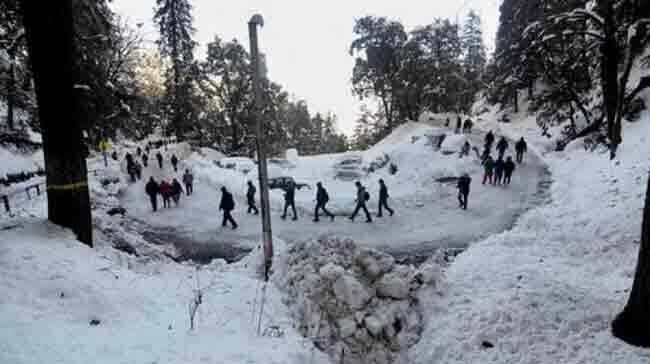 New Delhi: Power, water and communication lines remained out of order in Shimla and two other upper districts of Himachal Pradesh for the fourth consecutive day on Monday, even as 230 people stranded in snow between Fagu and Kufri were rescued by SSB personnel. In the national capital, shallow to moderate fog during morning hours delayed services of 41 trains. The maximum temperature settled at 19.3 degrees Celsius and the minimum at 8.6, a notch above the season’s average. Meanwhile, the IMD said the northwestern plains can witness further dip (of up to 4 notches) in the minimum temperatures from tomorrow. The tribal areas and upper areas of Shimla, Kullu and Sirmaur districts remained cut off from rest of the state for the fourth consecutive day as vehicular traffic was disrupteddue to slippery road conditions. A Sashastra Seema Bal (SSB) spokesperson said the paramilitary force evacuated 230 people stranded in snow between Fagu and Kufri. “We received a call from the Petroleum ministry that 130 persons (including officers in the ministry and their families) were stuck in snow. Apart from them, some tourists were also rescued,” the spokesperson said. The water supply pipes froze and burst at several places in higher hills. Several areas of Shimla remained without water for the fourth day while the supply was restored in half a dozen localities. Manali and Shimla shivered at minimum temperatures at minus 2.0 degree an minus 0.8 degrees Celsius respectively. Chief Minister Virbhadra Singh reviewed the situation and ordered release of Rs 25 crore for restoration works. Out of 565 roads closed due to snow, 208 have been reopened and 194 in Shimla and 63 in Kullu remain to be opened, official said. Similarly out of 700 water supply and irrigation schemes, 248 have been restored, they said. IMD said with the eastward movement of the current Western Disturbance as an upper air cyclonic circulation lying over north Pakistan and neighbourhood, dry northwesterly cold winds at lower and middle levels are very likely to prevail over northwest India’s plains from tomorrow. “Under these circumstances, the prevailing minimum temperatures over plains of northwest India are very likely to fall further by 2-4 degree Celsius till 13th morning,” it said. Cold wave tightened its grip on Kashmir as many places experienced coldest night of the season with famous ski-resort of Gulmarg recording the lowest January temperature in last years at minus 12.4 degrees Celsius. The night temperature across the Valley and Leh region, except Kokernag, dipped by several notches. In 2012, Gulmarg recorded the lowest night temperature in the month on January 13, when the mercury settled at minus 16.5 degrees Celsius. The mercury has not dropped below minus 12.0 degrees Celsius at the resort till last night. Kargil, in the Ladakh region, was another place which recorded its coldest night of the season so far with a low of minus 12.2 degrees Celsius. Meanwhile, the Srinagar-Jammu National Highway, the only all-weather road link connecting Kashmir Valley to rest of the country, was opened for traffic, three days after heavy snowfall had led to its closure. In Punjab and Haryana, the minimum temperatures hovered around the normal levels though fog cover disrupted rail, road and air traffic. Amritsar in Punjab was the coldest place in the region at 3.8 degrees Celsius, one degree above normal. Chandigarh recorded a minimum of 7.1 degrees Celsius. Dense fog was witnessed in Karnal, Hisar, Ambala, Patiala and Ludhiana.